In the last few years alone a number of new breweries have opened in the state of Wisconsin: Furthermore, Rush River, Ale Asylum, Silver Creek, and BluCreek; going back into even the late 90s is Pearl Street, Viking, The Great Dane, Milwaukee Ale House and Central Waters. Add to that the stalwarts of Lakefront, Capital, New Glarus, Sprecher, and Grays. Not to mention the plethora of other small breweries spread throughout the state such as Calumet, Titletown, South Shore, et al. Well, you can add one more to the list: O'So Brewing Company in Plover, just south of Stevens Point. If you're looking for short day trip, the grand opening for O'So is July 19 at the brewery in Plover; you can also hit Stevens Point Brewery in Stevens Point and Central Waters' Brewery in nearby Amherst. Owned by Marc Buttera, owner of Point Brew Supply, and Bart Peterson, a quality control engineer by day. Marc handles the brewing and agreed to answer some questions. Marc Buttera: I am originally from Kenosha, and headed to Stevens Point at age 19 to go to a tech school and get away from the craziness in my life at that time. My neighbor was the President of the local brewclub. He turned me on to the art of brewing and the rest is history. Madison Beer Review: What is some of that history? MB: I was a homebrewer for 13 years prior to opening O’so Brewing Co. My first beer was a Barley Wine, imagine that! My wife and I opened Point Brew Supply five years ago, and that exposure and immersion into all the ingredients helped me to learn very quickly. I studied everything from Fix to DeClerk, Noonan to Palmer in hopes of answering customers' questions about homebrewing. I am truly a geek at heart. MBR: Given the self-imposed "geek" label and Bart's implied geek-i-tude (he is a quality control engineer), do you take a particularly anaytical approach to the brewing process? MB: Our processes are tightly watched and regimented; documented almost to a fault. All of the information that we gather helps us to troubleshoot problems as they arise. We do this because of a strong concern for consistency from batch to batch. I would love to bring some PLC control into our brewhouse to make some of our jobs easier, but other things are more pressing at this time. [ed note: PLC is "programmable logic controls" - these are the computerized systems that can help automate the brewing process to reduce human error points] But, I also understand that Art plays a major role in the creation of unique beers. MBR: Your slogan is "Discover the art of freestyle brewing", can you talk about what that means to you and how you implement that? MB: Primarily I think it means to live and experiment through the beer. At Point Brew Supply, If I want to try something, I might tell the customer, “Hey, you wanna try this and see how it turns out?” Most of the time, they would agree to it. Basically, just trying to be creative at all times. We have yet to bring wild yeast into the brewery, but we plan on doing a series of beers called the Microbe Series. Corked and caged, and bottle conditioned would be fun. I had mentioned in the past about a pepper beer, that one is going to take some R&D. South Shore Brewing does some cool spicing that is inspiring. We just try to have fun. Make sure people have a good experience drinking our beer. Stick to the fundamentals and stay creative. MBR: So, what styles do you produce? MB: We have brewed about 13 beers to date. Our 5 main beers are year round (Big O, Hopdinger, Rusty Red, Night Train, Duzy Piwo). I really have a soft spot for Belgians so I hope to always have some Belgian-thing in the works. Just brewed a Belgian Saison for our Grand Opening on the 19th of July. 90 degree ferments are fun!! MBR: It seems like Central Wisconsin is the place to be for beer these days, how is your relationship with the other breweries there? MB: Very good, everybody is in this thing together. There are 6 breweries/brewpubs within 50 miles of each other. The competition brings out the best in people. Everybody has to get along! Central Wisconsin will soon be discovered. MBR: How do you see O'So fitting in with that community? MB: O'so fits in because we mud the style lines, in my opinion. We would like to cater to the people who want something unique. I am sure every brewery has a different reason for getting into the business (money is probably not one of them), but ours is to open peoples' eyes. The common goal in this area is good beer. If everyone makes good beer in this area, it is a selling point just to be associated with the area. Duzy Piwo is one of our flagship beers that means "Big beer" in Polish. This community has a huge Polish population. We want to embrace that. MBR: Last question, how can people get your beer? MB: Right now, we distribute in Central Wisconsin exclusively. Though, we do have plans to branch out in the near future. We are currently self-distributing. We can't afford the hit off the top and frankly, we are afraid that we will lose some of our personal touch with our accounts if we go to a distributor. I guess every brewery faces the decision at some point. 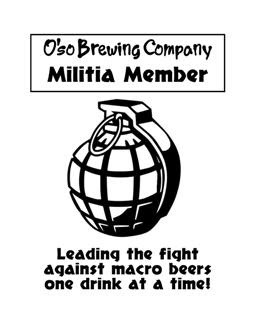 And, if you don't live in Central Wisconsin and can't make it to their grand opening on the 19th, O'So has a very busy summer running around the state pouring at festivals and tastings. O'so beer rocks! I love the Big O and Hop Dinger! I agree, my favorite is the Hopdinger.